February's project is Tide Pool Table Topper, using the 8" Qube. 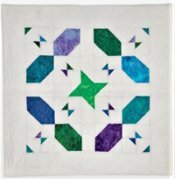 In this class you'll use our AccuQuilt die cutter and 8" Qube dies to cut a small table topper (with the option to make the project into a quilt approx. 68" x 68" if you wish—see Fort Collins store for additional fabric requirements for the larger project). Piece your table topper in class and see how perfectly your quilting projects will come together when you cut your pieces with your AccuQuilt! for Tide Pool Table Topper.